Importing from an emerging economy is exciting but needs to be done with enough research and good knowledge of the market. Both exporters and importers have to trust each other and maintain a strong working relationship for business to continue. As well as its benefits, there are many challenges that come with doing international trade and the right technology can minimize problems in a supply chain. Smart contracts are a good way to speed up transactions and make them secure, especially when recorded on a blockchain. As somebody with a strong interest in Africa, it is interesting to see how exports to Europe have tripled over the last few decades. A number of initiatives are in place to improve the flow of goods between both continents, one of which is called EBA. It stands for Everything but Arms initiative and allows for duty/quota-free imports to encourage economic growth in emerging economies. It is also a big incentive for people to import from these places as costs are considerably lower than buying from a developed continent such as Europe or North America. Smart contracts are perfect for dealing with customers and business associates in a different country because they are immutable and distributed. In a recent investigation by shipping company Maersk, they discovered 200 documents were needed for a simple shipment of flowers from Kenya to the Netherlands. Manual paper-based processes like this are still common and the information is locked away in organizational silos. Today 90% of goods in global trade are carried by the shipping industry but supply chains are slowed down by complex point to point communications. A distributed ledger platform uses smart contracts on a blockchain and is accessible to everybody in the production line, including the end-consumer in some cases. This creates trust, efficiency, and better user experience. Ethiopia is the fastest growing economy in Africa and has many import opportunities available. The services sector is at an all-time high and there are 12 industrial parks either under construction or fully operational. Their leather products and textiles are being sold throughout the world with positive endorsements from Tescos, Primark, and H&M. The Ethiopian Investment Commission, Ethiopian Leather Industries Association and Addis Ababa Chamber of Commerce oversee the country’s textile industry. Manufacturers can also be contacted directly to discuss products available and shipping. Once this has been arranged, finding the right technology for importing goods is critical – especially when a company is dealing with people they have never met. Input-Output Hong Kong is a technology firm focused on providing financial services to three billion unbanked people in the world. They are a blockchain company with global reach and have a presence in Ethiopia, where they recently signed a Memoriam of Understanding (MoD) with the government. This MoD is in place to tackle some of the ongoing issues in Ethiopia using innovative technologies and smart contracts. IOHK are also training Ethiopian students in Haskall, a programming language used to build the Cardano blockchain. Finance in emerging economies can be a problem when paying for services remotely. Sending money abroad is costly and one of the main challenges importers and exporters face. Exchange rates change on a daily basis and although relatively low compared to the rest of Africa, corruption still exists. Obviously, cash payments account for almost 100% of transactions in this market so importers need good communication with trusted partners to ensure no funds are lost. Companies must research the market and who they are dealing with thoroughly before paying for anything. That being said, as cryptocurrencies and smart contracts continue to become more accessible, I’m sure they will have a drastic impact in this space. Air freight is a fast and reliable way to move goods between continents. Although it can be expensive, the method is perfect for FMCG and temperature sensitive goods. With large heavier shipments it is often cheaper to transport by sea but with lighter products such as flowers, air freight is the best option. Ethiopia is the second largest flower producer in Africa after Kenya with a 9% share of the global market. The country earned $271 million USD in 2017 from exporting horticultural products to mainly Belgium, Netherlands, Saudi Arabia and the USA. With weekly often daily cargo flights out of Ethiopia, flowers are available for import almost anywhere in the World. The climate of this country is perfect for growing roses as it provides year-round natural light combined with hot days and cold nights. As goods need to be moved quickly, there is a demand in this sector for technologies offering real-time updates, temperature analysis, and smart contracts. Modum.io and Smart Containers are two companies in this space I am a fan of and have been tracking for a while. 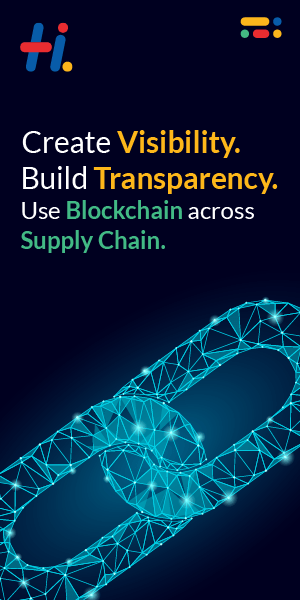 Modum.io are utilizing blockchain technology and smart contracts to improve the supply chain of temperature sensitive goods. Beginning with the pharmaceutical industry they are now moving into other sectors, such as horticulture. Sensors are placed into containers (ship or air) and record environmental conditions a package experience en route to its destination. Founded in 2016 and based in Zurich, the company aim to streamline supply chains through emerging technologies. They are a good example of how smart contracts can store and verify critical data faster and more efficiently. Similarly, Smart Containers is expanding its service to improve the import and export of fresh produce. The company claim to be 75 times more reliable than the current market leader and can boast less than 0.1% in temperature deviations. One of the challenges many importers and exporters face is distance. Usually, the further the destination, the more complex transportation is so companies must make the correct arrangements in regards to timing, time differences, legal requirements, forms and also insurance. Blockchain and smart contracts have the potential to make all of this more efficient as transactions will become faster, cheaper and automatic. Smart contracts often function as multi-signature accounts so that something happens only when a required percentage of people agree – this can be 4 people or 400 people. The insurance of goods in transit is an area they can make a real difference as policies are written in code and decentralized without the need for human interaction. Payouts are only made when things actually go wrong and customers also have a more reliable way to choose their provider, based on accurately stored data. Coffee is a major export for Ethiopia from which it earned a record $866 million USD in 2017. On my last trip to Addis Ababa, I was lucky enough to visit the Moyee Coffee roastery and see first-hand how blockchain and smart contracts are improving this industry. Working alongside companies Bext360 and Stellar they are boosting the production line while at the same time helping farmers get paid what they deserve. It is a sad truth that large coffee corporates such as Starbucks and Costa are less farmer friendly and sustainable than they would like you to think. Thankfully, these days consumers want to be more aware of where products come from and how they were produced. By simply scanning a barcode Moyee customers can track the journey of a coffee bean from farm to cup. It even gives them an option to send farmers a tip! This just shows the power of blockchain and smart contracts, and they can be used in almost any context. What interests me, is how this technology can improve the process for importers and make their companies more profitable and efficient. When it comes to importing and exporting goods the legal system in different countries is crucial to know. Safety laws are important, especially when it comes to food because authorities want to know there is no contamination or risk of poisoning. Many countries have complex bureaucratic systems (I know Ethiopia does) that require a variety of documents and certificates to be signed and sent. Certain documents are needed to export products out of a country just as different documents are needed to import them into another. Having an expert or lawyer onside is essential, as is investing in the right technology to make the process a smooth one. Africa is certainly an exciting market with lots of good products available for import. As we move into a new era of technology it is important companies take notice now, as within the next decade blockchain technology is going to be everywhere. By understanding and implementing smart contracts, importing goods from far-away places like Ethiopia can be made a lot easier. Understanding the culture and language of the country you are buying from is always worthwhile as well and will improve overall sales and credibility. Emerging economies are already benefiting from blockchain tech but also improving profitability for entrepreneurs and business owners. With the right knowledge, contacts, and technology to hand – this is an area I see doing very well in the near future.